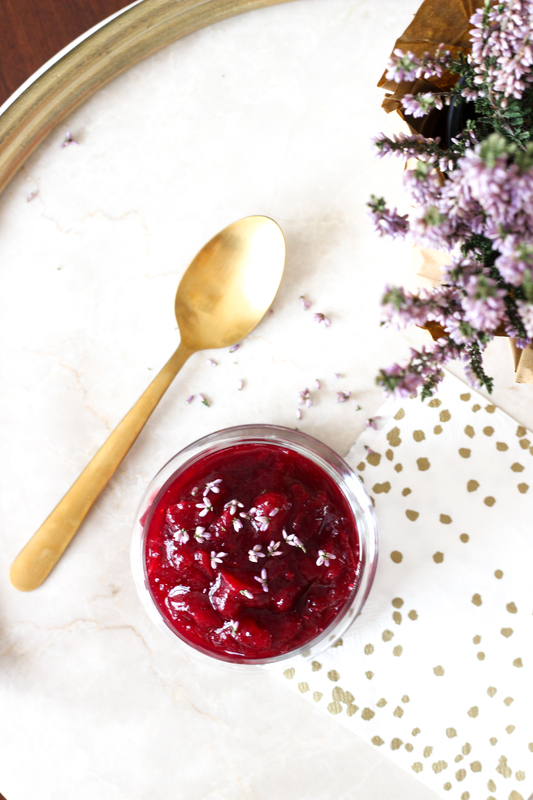 This lavender and lemon cranberry sauce was a big hit on Thanksgiving this year! Even the toughest critics in my family were quite impressed with my culinary creation. I’ll be making it again for Christmas and I although I winged the recipe, Im sharing the steps and ingredients below. I highly recommend giving it a try! I’m pretty proud of myself for not only cooking something that I didn’t mess up, but something that everyone loved. I kind of winged it (like most of my cooking) and prayed it would turn out. That it did, but unfortunately I can’t give exact measurement. Here are the ingredients though! And a couple important steps to note. You’ll also need a tea ball (this is the one I use) or other infusion device to steep the lavender in the water first. I probably had it going for about 15-20 mins until the water turned pretty purple. 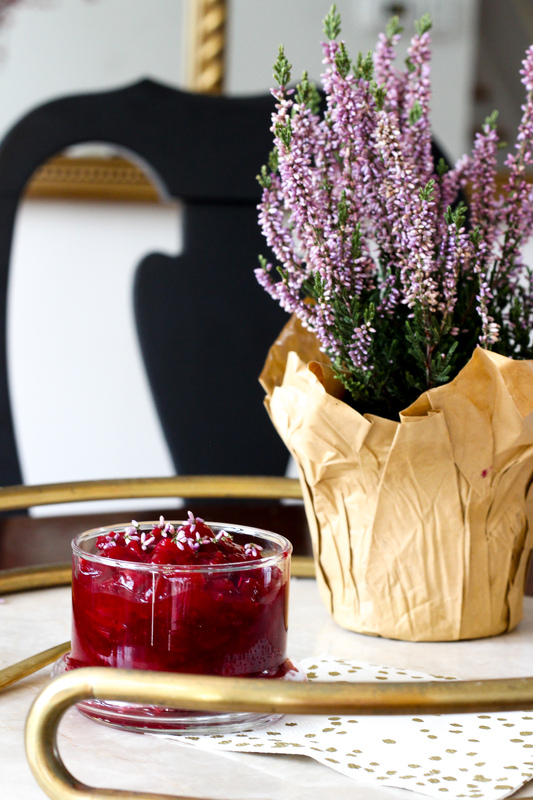 Then, follow the basic instructions to make cranberry sauce using your lavender water. First, add the cranberries, then the sugar and the lemon zest. I used the lemon zest from 1 lemon and about a bag and half of cranberries. I only used a little bit of sugar this time too. Cook till the cranberries burst and then let it cool before serving. I found culinary lavender at a local spice house but you can purchase online as well. I’ve been slightly obsessed with it lately and using it in my coffee almost daily. 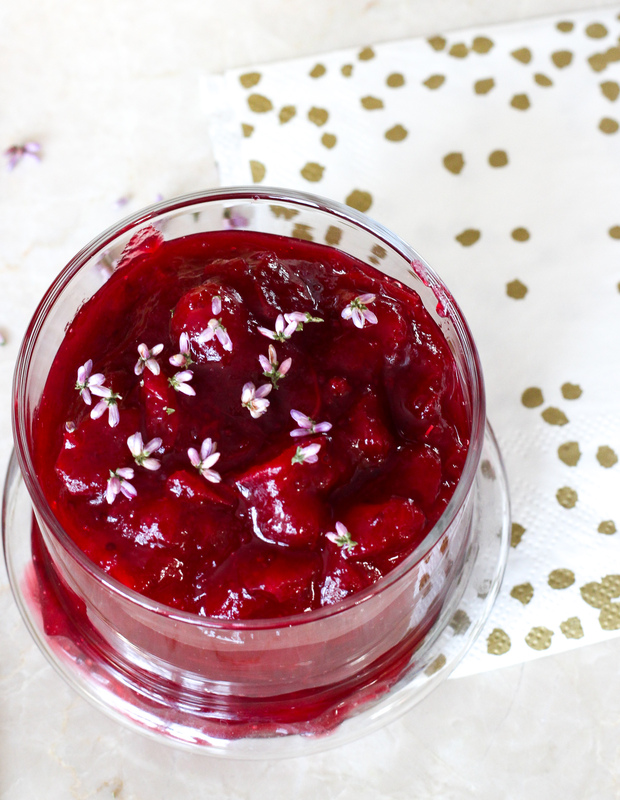 It has a soothing taste and makes for a beautiful garnish for recipes. I hope you give it a try! And, if you like this recipe, be sure to check out “Our Cheesy Christmas Tradition” for a secret family recipe! PS. The plant pictured is actually called Calluna Heather .. (shh, not lavender!) But rest assured, I really used REAL lavender for this recipe!!! What i like best is writing about things that can actually help readers, even if it as simple as getting readers to think about something from a different pervepctise.I enjoy your site and read a a lot of your articles. That’s what makes it so great. You are writing from a personal experience and that makes it engaging. Great Job!